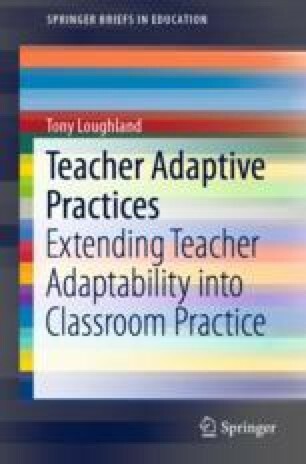 This chapter proposes a combined classroom observation and learning improvement programme based on the model of adaptive teaching presented in this study. This proposal positions this research programme within the science of learning improvement that values the development of rigorous yet usable measures that have direct application to the improvement of learning conditions for students in classrooms. It does this through a brief review of the principles of effective professional learning before examining what the emerging field of learning implementation and improvement science might add to these principles. It then applies these principles to three proposals for teacher professional learning that employs the teacher adaptive practice scale as a diagnostic and improvement measure. Albers, B., & Pattuwage, L. (2017). Implementation in education: Findings from a scoping review. Retrieved from Melbourne: http://www.ceiglobal.org/application/files/2514/9793/4848/Albers-and-Pattuwage-2017-Implementation-in-Education.pdf. Dawes Duraisingh, S., James, C., & Tishman, S. (2016). Out of Eden learn: An innovative model for promoting crosscultural inquiry and exchange Retrieved from http://pz.harvard.edu/sites/default/files/Out%20of%20Eden%20Learn%20white%20paper%20May%202016%20%28with%20links%29%281%29.pdf. Harvard Graduate School of Education. (2018). Project Zero. Retrieved from http://www.pz.harvard.edu/. Institute for Education Sciences. (2018). What Works Clearinghouse. Retrieved from https://ies.ed.gov/ncee/wwc/. Institute for Effective Education. (2018). Best evidence encyclopedia. Retrieved from http://bestevidence.org.uk/index.html. Lawrence, P. (2016). Teaching moves that matter. Choose your own adventure. Retrieved from http://lawrenceloveslearning.blogspot.com.au/2016/10/teaching-moves-that-matter-choose-your.html. New Zealand Government Ministry of Education. (2018). BES (Iterative Best Evidence Synthesis) Programme—What Works Evidence—Hei Kete Raukura. Retrieved from https://www.educationcounts.govt.nz/topics/BES. Salopek, P. (2016). Visiting a Couple Locked in an 1800-Year-Old Embrace. Out of Eden Walk. Retrieved from https://www.nationalgeographic.org/projects/out-of-eden-walk/articles/2016-02-visiting-a-couple-locked-in-an-1800-year-old-embrace. Timperley, H. (2008). Teacher professional learning and development. Retrieved from http://unesdoc.unesco.org/images/0017/001791/179161e.pdf. Visible Learning. (2018). Hattie ranking: 195 influences and effect sizes related to student achievement. Retrieved from https://visible-learning.org/hattie-ranking-influences-effect-sizes-learning-achievement/.